2. why should there be mercy? there is no last word just as there is no first, huh? Place food sensually inscribed by cutlery, a letteropening carving knife, a sudden failure to misunderstand, a quick motion, up against the hardness of the wall and searching stubby fingers parting thighs. Some consent required, of course, since we have dressed them in such complicated clothes. It felt like a life and death battle between the instrument and my self, as if it were not possible without invitation, a burden passed on. “It felt like a life and death battle between the instrument and myself.” Jazz pianist Yosuke Yamashita. Bourgeois affectation or no bourgeois affectation, stylistic error or no stylistic error, your ability to reason several arguments simultaneously makes your work stand out, at least in my mind. I loves your style and sentence structure, dude, your maddening habit of thinking outside the box makes me jealous as all hell. My words are my children. Great writing! the piano is not dead. You have given birth to it. Oh no. 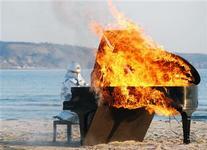 Now there will be little burning piano babies. I think one is at my door. no i was wrong. it was the neighbors door. ohh, i so like you already… my fingers itch to write and my ears to listen… thrz nothin better than a piano.. on fire… sizzlin… no1.. is that existentialism hiding behind john lennon.. no.2 the best… glad i found ya.. definitely be back.. thanks for the enlightening linguistics..